In show business and sports, the most popular figures eventually become known only by their initials: MJ, JFK, AI. Rarely, a scientific superstar can also become known by their initials – such as HM, the most famous amnesiac in modern history. Reduced to initials to protect his privacy, Henry Gustav Molaison became known as HM in volumes of scientific literature published about his unusual, surgery-induced memory deficit, a condition that revolutionized theories about how memory is stored in the brain. Molaison died in December 2008, at which point his name became widely known outside of the researchers in Connecticut, Montreal and Boston who researched the properties of his amnesia. But soon, the secrets of HM’s unusual brain will become very open access, as scientists at the University of California-San Diego make the organ accessible down to individual cells as part of an ambitious brain-mapping project. That process, known as Project HM, kicks off a new phase today with a live webcast of the slicing of HM’s brain – a method that, I promise, is not as gory as it sounds, if you want to take a peek (Full disclosure: I used to slice up rat brains for a living, so my gross-out standards may be skewed). If you’ve never taken a psychology or neurobiology course, the story of HM is one of accidental tragedy turned into research bounty. Molaison suffered from debilitating epilepsy related to a childhood accident where his head was run over by a bicycle. In 1953, when he was 27, the seizures became so bad that doctors opted for radical surgery, removing large pieces of brain tissue that were thought to trigger his seizures. That tissue turned out to be the hippocampus – a brain region not widely thought to have any special function at the time. But when Molaison began to exhibit memory problems, specifically anterograde amnesia, neuroscientists began to wonder if they had accidentally struck upon evidence that the hippocampus was an important brain region involved in memory. Anterograde amnesia is the inability to store new long-term memories. Molaison’s memories before his surgery were intact, and anything taught to him after the surgery he could remember for a short period of time – minutes, or hours with practice. But most of that newly acquired information did not make the transition to long-term memory; for instance, a person HM met after the surgery would have to re-introduce themselves every day, because he did not remember ever meeting them! 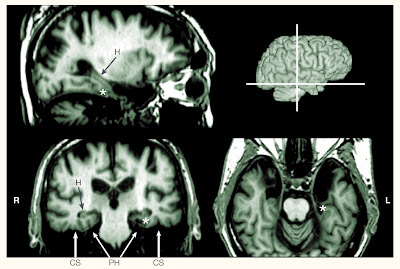 The fact that Molaison only began having these problems after his hippocampus was removed, combined with evidence of similar memory deficits in other patients with hippocampal damage, was strong evidence that long-term memory is stored by this particular brain region rather than across the entire brain, as was once believed. But that wasn’t all – some of the most interesting things about HM discovered over five decades of research were in the things that he could still learn. Motor learning was intact – he would perform better over subsequent days with repeated testing of a drawing task, even though he always claimed to be taking the test for the first time. Similarly, LaFee reports (the first time I’ve heard this fact) that HM learned how to play golf after his surgery. In a 2002 review paper by Suzanne Corkin, an MIT neuroscientist that studied HM for nearly five decades, she reported that Molaison could draw from memory the floor plan of the house his family bought six years after his surgery, a demonstration of learning Corkin attributed to repetition and the recruitment of brain areas outside the hippocampus. In fact, HM’s deficits both pointed to the hippocampus as a the primary locus of memory and directed researcher’s attention to other areas of the brain involved in memory, where skills such as motor learning remained intact even in HM’s special case. Hence the continued value of HM’s brain as a tool for studying memory, even after death. In recent years, the latest in brain imaging technology has been applied to get a better picture of just what was damaged by Molaison’s fateful surgery, but fMRI is no substitute for the brain itself. Annese’s meticulous preservation of the brain, should all go well, can be combined with the volumes of behavioral research on HM to give scientists a more detailed picture of where different types of memory are processed.